Last month, the final #FastFriday post from the Fast & Furious 8 set featured a cast photo, revealing that production had wrapped on this highly-anticipated sequel. And that the first trailer would arrive sometime in December. Earlier this week, Vin Diesel shared a new photo on Facebook, announcing that the first trailer will arrive on December 11. He also subtly addressed the rumors of increasing tensions between himself and his co-star, Dwayne Johnson. Dwayne Johnson surprised fans last month with a Facebook post where he called out some of his male co-stars, calling them "candy asses." While he wouldn't specify what co-stars were the target of his rant, several rumors surfaced that claimed the actor was referring to Vin Diesel, who has a history of keeping the cast and crew waiting for hours before he's ready to shoot, which reportedly doesn't sit well with Dwayne Johnson. There have been rumors that this entire "feud" is all a publicity stunt, leading up to a pro wrestling match between Vin Diesel and Dwayne Johnson at WrestleMania next spring, just days before Fast & Furious 8 hits theaters. Here's what Vin Diesel had to say below on Facebook, subtly addressing the "tension." "The trailer for F8 is going to blow your mind... New York City December 11th.You will see why there was tension, you will understand the intensity. #HappyTorettoTuesday"
Fast 8 takes place in New York, with production set for the Big Apple, Atlanta and Russia. The crew has already shot in Cuba and Iceland. It is believed that the Cuba scenes will introduce fans to Dominic Torreto's Cuban family. Anticipation is higher than ever for this sequel, since we know this will be the first installment of the franchise's final trilogy. Universal has already set an April 19, 2019 release date for Fast & Furious 9, and the franchise closes out with Fast & Furious 10 on April 2, 2021. F. Gary Gray, who directed last year's critical and commercial sensation Straight Outta Compton, is taking the helm on Furious 8, working from a script by Chris Morgan. The writer is responsible for penning every movie in the series, except for the first two, 2001's The Fast and the Furious and 2003's 2 Fast 2 Furious. Universal has already set an April 14, 2017 release date for Fast & Furious 8, and it currently has that date all to itself. But it will be hitting theaters one week after Warner Bros.' Going In Style remake and Sony's Smurfs: The Lost Village. 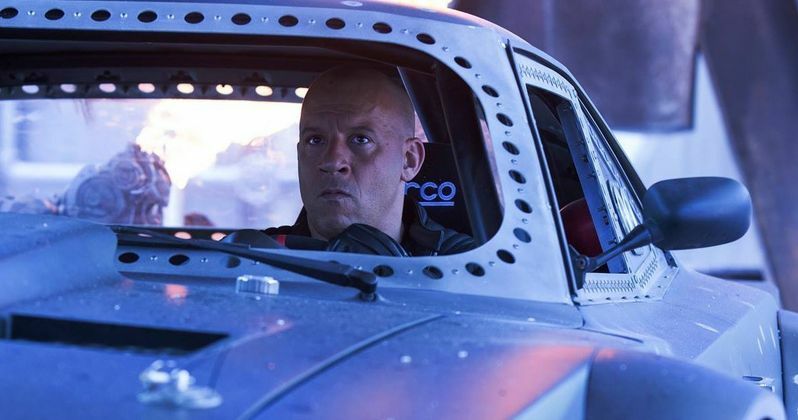 Take a look at this new photo from Fast and Furious 8, as we get ready for the first trailer's debut.